In a break from grounds maintenance projects, the municipal Elections Officer has heard about your skills and asked for help identifying voting divisions that had a low turnout at the last election, or divisions where there were difficulties understanding the voting process. He asks for your help and you suggest the results should be presented in Google KML format, so staff can view them without having to use a full-blown GIS system. The OverVotes and UnderVotes attributes are an indicator of how well the voting process was understood. Each voter gets to vote for up to 10 candidates (out of 30). OverVotes are those voters who voted for more than ten candidates. UnderVotes are the number of votes that could have been cast, but were not (for example, the voter only voted for five candidates). The first task is to merge the statistical election data onto the actual features. We&apos;ll use a FeatureMerger transformer to do this (more on this transformer appears later in this course). Add a FeatureMerger transformer. 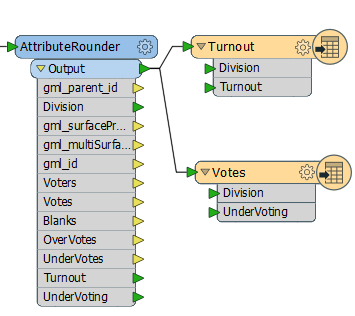 Connect the VotingDivisions data to the Requestor port, and the Councillors (result) data to the Supplier. 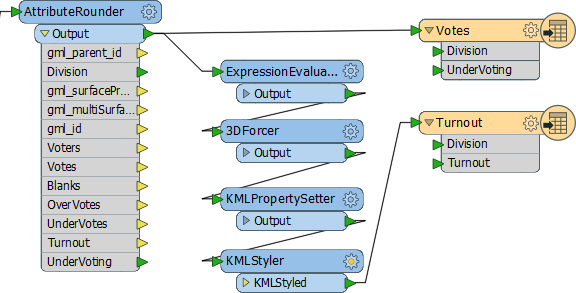 Click the cog-wheel icon to open the FeatureMerger parameters dialog. For both the Requestor and Supplier join fields, click the drop-down arrow and Attribute Value > Division. Click the OK key to close the dialog. Add an Inspector transformer after the FeatureMerger:Merged output port. Run the workspace. Ignore any warning or log message that reports Unexpected Input. 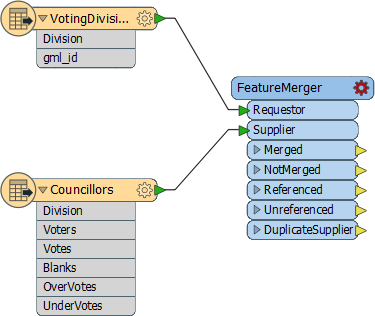 Ensure that the Feature Count on that connection is the same as the number of incoming features from the VotingDivisions (note, there will be extra features from the Councillors data that is not used, because that includes divisions outside our area of interest). Now that we have the numbers we need, we can start to calculate some statistics. 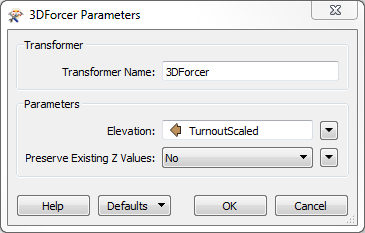 To do this we&apos;ll use an ExpressionEvaluator transformer to first calculate voter turnout percentage for each division. Place an ExpressionEvaluator transformer after the FeatureMerger - connect it to the FeatureMerger&apos;s Merged output port - and open the parameters dialog. Set the New Attribute to Turnout (to match what we have on the destination schema). You don&apos;t need to type this in - the @Value(Votes) and @Value(Voters) part can be obtained by double-clicking that attribute in the list to the left. Click OK to close the dialog. If you wish you can reconnect an Inspector and re-run the translation, to see what the result is. It&apos;s a bit excessive to calculate our statistics to 13 decimal places or more. We should truncate these numbers a bit. Click OK to close the dialog and, again, run the workspace to check the results if you wish. Run the workspace and examine the output in Google Earth to prove it has the correct attributes and is in the correct location. The project is done, but the output is very plain. It would be much better to improve the look of the results and there are several ways to do this with KML. We could simply color the voting divisions differently according to their turnout/overvotes, but a more impressive method is to use three-dimensional blocks. The height of each block should be proportional to the turnout for that division. However, for differences to be clearly visible, the vertical scale will need some exaggeration. 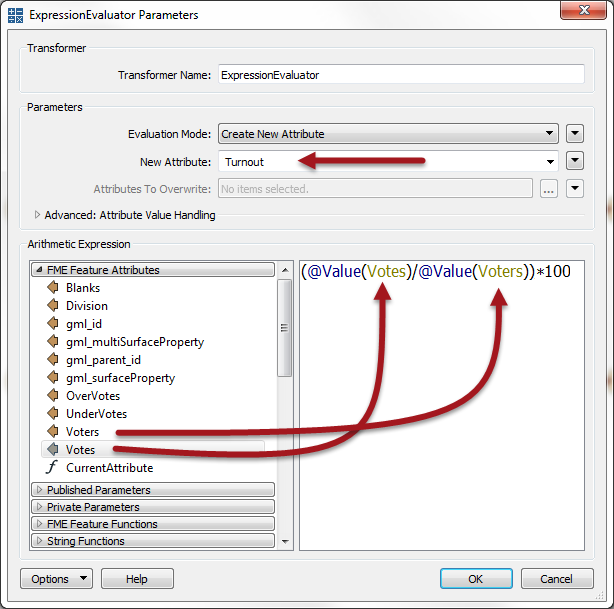 Place an ExpressionEvaluator between the AttributeRounder and the Turnout feature type. 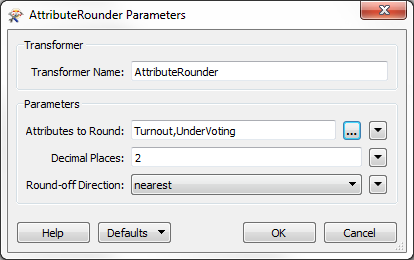 Set the parameters to multiple the Turnout attribute by a value of 50. Put it into a new attribute called TurnoutScaled. Add a 3DForcer transformer. This will elevate the feature to the required height. 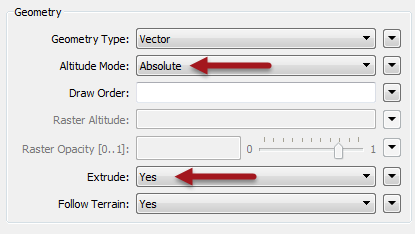 Open the parameters dialog and set the elevation to Attribute Value > TurnoutScaled. 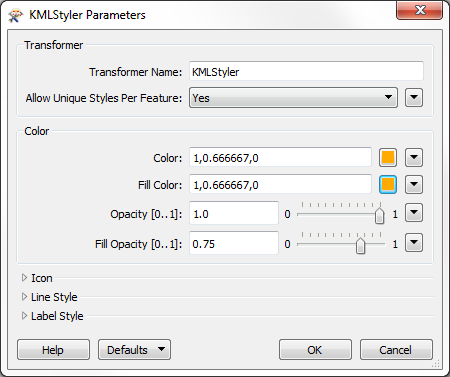 Open the parameters dialog. Select a color and fill color for the features. Increase the fill opacity to around 0.75. These 3D blocks will show users where the voting turnout is high/low in the city. If you wish, repeat these steps to give a 3D representation to the UnderVoting statistics.